Have you ever in your life complained? About anything? A few years back, Stef complained constantly that she couldn’t find any good coffee in all of Las Vegas. This was so long ago, all that was available was Star Schmucks and other forgettable coffee chain store options. Stef would buy coffee beans from these stores, grind and brew at home, and the coffee tasted hideous. Stef couldn’t put her finger on why. Fortunately Glenn could – he ordered a small home roaster from Ebay and some green coffee beans from Sweet Maria’s. Stef tasted freshly roasted coffee for the first time. The complaints stopped. Glenn doing small batch roasting with Sonofresco roasters. On a trip to visit friends in Tucson, Arizona, Glenn and Stef saw a guy roasting coffee in the back of his truck, bagging it, labeling it, and selling it. Two months later, in July 2011, Frankly Good Coffee was set up at it’s first market. A business was born. 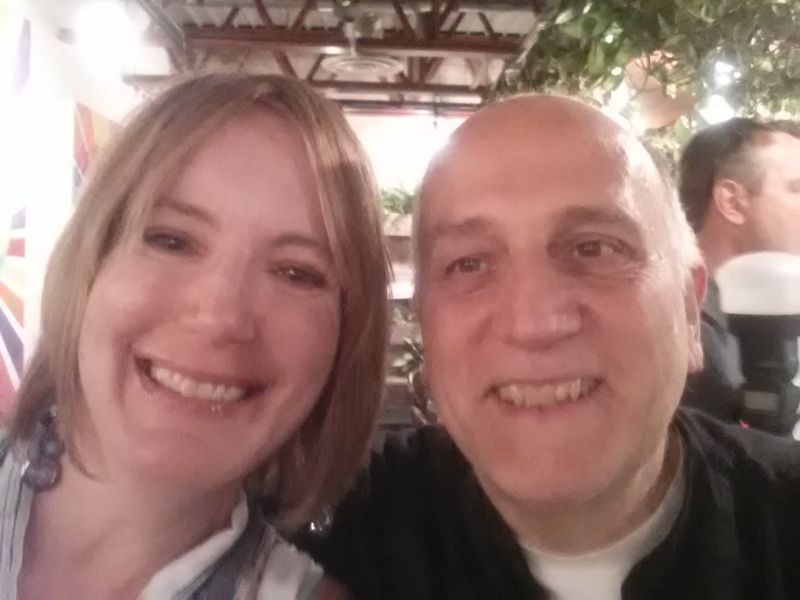 Glenn and Stef at the Fresh52 market – July 2016. Stef rarely orders coffee in restaurants – because most restaurant coffee is notoriously wretched. Stef DOES order the coffee at Vegenation in downtown Las Vegas. Why? Because Vegenation is one of the rare restaurants in Las Vegas that serves delicious coffee. They brew each serving fresh, using French presses. That combination is simply unbeatable. Honestly, most coffee shop coffee doesn’t compare. Vegenation is a community based restaurant serving fresh, global street food. Their food is 100% plant based. Stef with Vegenation Owner | Chef Donald Lemperle at the 555 in Honor of Food Revolution Day Dinner.